Turkish President Recep Tayyip Erdogan has accused the Netherlands of state terrorism and having a “rotten” character as the diplomatic spat between the two countries deepens, adding he would mobilize the Islamic world to fight xenophobia, racism and Islamophobia. The Turkish government has accused the Netherlands, along with Germany, of Nazi-like behavior after authorities in the two countries prevented Turkish ministers from campaigning to expatriate Turks in favor of an upcoming April referendum, which critics say would give incumbent President Erdogan too much power. Last weekend, Turkish Foreign Minister Mevlut Cavusoglu was denied landing permission ahead of a speech, and Family Minister Fatma Betul Sayan Kaya was not permitted to enter her country’s consulate in Rotterdam, and was promptly escorted to the German border. 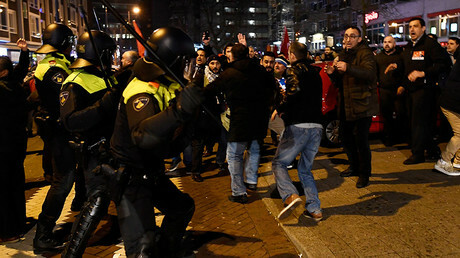 The Dutch authorities are accused of using disproportionate force including dogs and water cannons on Turkish protesters in Rotterdam. In return, Turkey cut off all high-level diplomatic relations. Erdogan has said that an apology from the Netherlands is not enough, and is considering further sanctions. 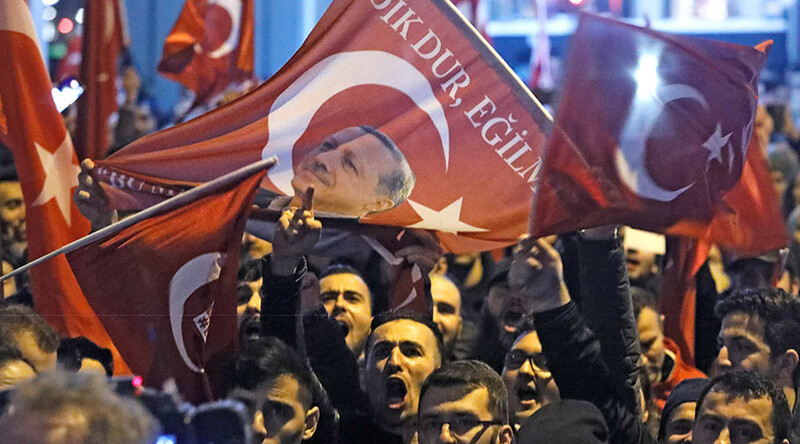 “Some European countries have turned into toys of racist and fascist parties,” said Erdogan, using the opportunity to weigh in on the rise of far-right parties such as the Dutch Party for Freedom and the AfD (Alternative for Germany). Erdogan added that Turkey would be calling upon the Organization of Islamic Cooperation (OIC), a 57-nation body of predominantly Muslim countries, to help it fight the reemergence of racism, xenophobia and Islamophobia on an international level. But the Turkish President’s remarks did not go unnoticed in the Netherlands, where Dutch Prime Minister Mark Rutte fired back, calling Erdogan’s comments about Srebrenica a "disgusting distortion of history." "We will not lower ourselves to this level. It is totally unacceptable," he told the Dutch broadcaster RTL Z. Earlier in the crisis, Rutte insisted that his country has the right to deny Turkish politicians opportunities to stage mass rallies on their territory, due to both security concerns, and disagreements with the Erdogan’s plans to expand his influence through the upcoming referendum.